Sometimes you have a little bit of something left over that you need to eat before they go bad, but it isn’t really enough to make an entire meal around—a few potatoes that are going soft, a bit of cheese that is in danger of drying out. And sometimes you want to make just a small batch of something—dinner for two or a side dish for four. This is the perfect recipe for that. My phone took a terrible picture under the fluorescent lights, and I was too hungry to grab my camera, alas. I’ll have to get a better picture later. With some crusty bread and a salad, this is dinner for two, or a side dish for four. 1/2 of a 10 oz. package of frozen spinach, thawed, drained, and chopped. Add the bacon to a small pot and heat over medium heat until the fat starts to render out of it. Add the onion, reduce the heat to low, and continue to cook, stirring occasionally until the onions become translucent. Add the stock or broth, increase the heat to high and bring to a boil. When the stock boils, add the potatoes, stir, and bring back to the boil. Reduce heat to medium-low and simmer, stirring occasionally until the potatoes are cooked. Optional: With a slotted spoon, remove some of the potatoes to a small bowl. Use an immersion blender to puree the soup. Add the reserved potatoes back to the pot. Add the spinach and simmer five minutes. Add the cheese and stir until melted. Adjust seasoning and serve. Pureeing some of the potatoes is completely optional. 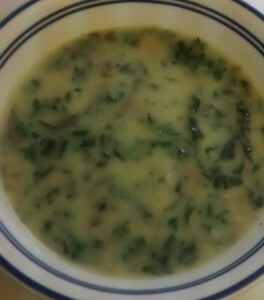 Alternately, you could puree all of the potatoes and even some or all of the spinach. I have made this with American cheese. Yes, it’s good! Between the cheese and the bacon, you probably will not need salt. If you don’t have frozen spinach, you can substitute whatever leftover vegetables you have: broccoli, cauliflower, or even peas would work well here. You can use fresh spinach. Just steam it first and drain it well. You can make this vegetarian by eliminating the bacon and sauteéing the onion in oil, but you will lose a bit of flavor. (You can add a bit of liquid smoke to compensate.) You can make this vegan by using soy cheese.